'Warm, wise and funny' Rachael Lucas. In the gorgeous seaside town of Whitstable, brokenhearted Deb begins to swim each day and gathers a new group of friends around her. But can the magic of sea heal the hurt of the past? Or will family ties drag her underwater again? A heart-warming, funny and poignant story of romance, friendship and second chances. It's also a song to the author's home town of Whitstable, where the sea is smooth, the shingle is painful on bare feet, and the air is full of possibilities. Although I would never even consider dipping my toe in the freezing North Sea, it was lovely to take a trip to Whitstable courtesy of Katie May. Whitstable is a real place on the North coast of Kent and you can read more here about places to see in Whitstable in the guest post that Katie May wrote for my stop on the blog tour. Deb has just split up with her husband, Derek, after she stopped turning a blind eye to his drinking and affairs. Deb finds herself looking forward to the twice daily high tide so she can forget her troubles and go for a swim in the sea. For a while, she has the beach to herself then one day she notices that she has company in the form of ex-corporate lawyer and recent divorcee, Maisie. 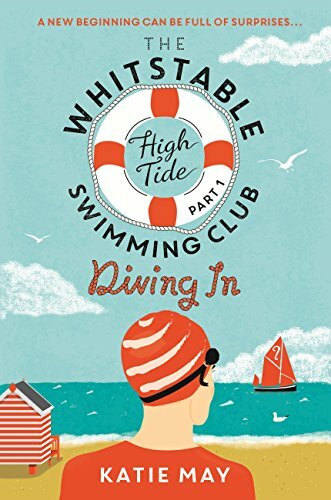 Due to their shared love of swimming, the pair strike up an unlikely friendship as they both come from different worlds: Deb is struggling to make ends meet living in a pokey bedsit and Maisie is affluent enough to be able to start again with a dozen new everything. When a few more people start visiting the beach at high tide, The Whitstable High Tide Swimming Club is born, but the new club has barely got off the ground when developers threaten to move in. The town of Whitstable is almost a character in itself; it sounds so quaint and picturesque, and Katie May's love for her home town is very apparent. I loved the blossoming friendship between Deb and Maisie, both women are in their 50's and find themselves having to embrace single life again with Deb doing a bit more of the embracing (and good for her)! I also thought the storyline about the developers was excellent - developers always seem so cold and callous as they bulldoze their way in and change our beautiful landscape. Having something to fight for brought the members of the swimming club closer together and I actually felt as if I was an honorary member of the club by reading along as events were unfolding. This is only part one, so I am delighted that Katie May has more visits to Whitstable planned for us readers. I think we have only scratched the surface of some of the characters and I'm really looking forward to reading more about them. 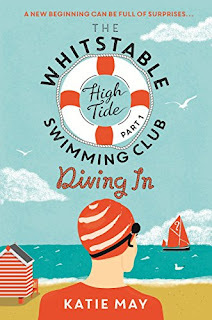 With some laugh out loud moments and some serious issues, The Whitstable High Tide Swimming Club: Part One: Diving In is a super start to a series set in a beautiful location and filled with colourful characters we can all relate to.